The end of January is upon us, which serves as a good reminder of all those well-intended resolutions we set for the new year. Do you have your sights set on a professional move this year? And, no, we’re not talking about relocating for your job. Instead, we’re talking about starting an entirely new career path. Love to work from home, but don’t have that flexibility in your current 9–5? When you’re a real estate agent, you can work from your home office on a regular basis. Yes, you’ll be showing homes and helping buyers and sellers in other ways, but there is no one to tell you that you need to be in a designated office space every day you’re on the job as an agent. Not only can you work from home when you have a career in real estate, but you also are able to determine your daily work schedule. You’ll schedule showings and open houses during various hours of the day or on the weekends. As a real estate professional, you won’t need to worry about a designated start and end time! 3. Your earning potential is unlimited. Locked into a job where your earning potential has peaked? Real estate could be the industry that helps you recognize your true earning potential. A commission-based salary means that the sky is the limit when it comes to earning. In real estate, the more transactions you complete, the more money you make. Don’t set boundaries when it comes to what you can achieve. 4. You are helping someone with every transaction you make. Don’t we all want a job where it feels like we’re helping to make a difference? As a real estate agent, you truly are. Helping someone buy or sell a home means helping them make what is potentially the biggest transaction of their lives. Being a part of that is not something to minimize. As a real estate professional, you are destined to impact each client you work with. 5. You don’t need years of schooling to be an expert. For many professional positions, a four-year degree is required, and some professions require even more schooling. The real estate industry does not require a bachelor’s degree or prior training that comes from any particular field. There are a few required courses for real estate professionals, a licensure exam and a wealth of on-the-job experience. And, let’s not forget about that unlimited opportunity for success despite any amount of schooling! 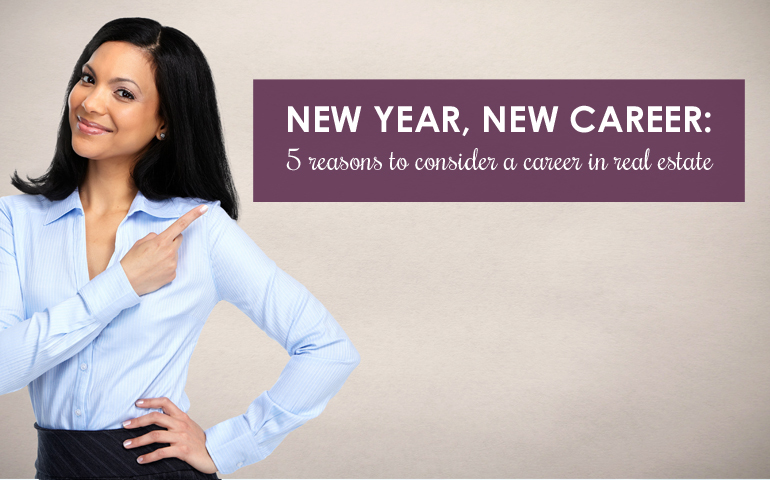 We’ve given you five great reasons to consider a career in real estate. If you still have some questions about making a professional move to this fast-paced industry, contact us today!